Harrogate plays host to stunning gardens an countryside, couple this with the vast array of eclectic architecture and it is not hard to see why Harrogate is a great place to live. Our shutter experts are Yorkshire locals who love nothing more than find you the perfect shutters for your home! 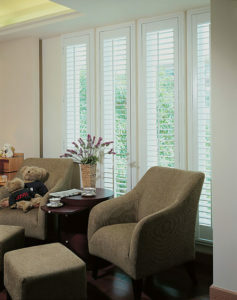 Get the luxurious interiors you have always desired with Just Shutters Harrogate! Contact the team of shutter experts by calling 01757 602459. Alternatively, you can use the buttons above to book a home design visit or download a free brochure. Window shutters is all we do – we are specialists that pursue perfection. This perfection relates to our service as well as our product offering. All of our staff strive to ensure that each customer they come into contact with is fully satisfied with their experience. Therefore, we are delighted with the high volume of positive feedback we receive from across the UK. We have been awarded a 9.9/10 rating on Checkatrade as a result of over 1800 independent reviews! Shutters have long been favoured by interior designers, gracing the covers of glossy magazines, new build homes and hotels alike. It is not hard to see why shutters are so desirable! Naturally, their timeless style makes for a stunning addition to any home. Furthermore, as we stock one of the UK’s largest ranges of shutters (including our own exclusive ranges! ), we are confident that we will find the right shutters for you – what ever your tastes! Browse our stunning shutter galleries to see examples of your previous work. There is also more than meets the eye with shutters. As well as being stunning, they are incredibly practical. This practicality comes as a result of their many unique features they possess. Features such as; being child safe, being easy to clean and being incredibly durable. Furthermore, we offer a lifetime guarentee!